The ValueComp is a tool designed for comparing value scales through a value scale filter window. In addition the window allows you to set up a composition with ease. Double sided printing. An absolutely necessary aide for plein air artists. Hold the ValueComp about one foot from your eyes, see the object through the value filter window with one eye. You can compare the object with each gray scale value to decide its value. In the beginning, try to limit your value range to only four or five within scale 3 to 7. Later on you can fine tune by adding more value; finally add the lightest value 1 & 2 as highlights, and 8 & 9 as accents if necessary. 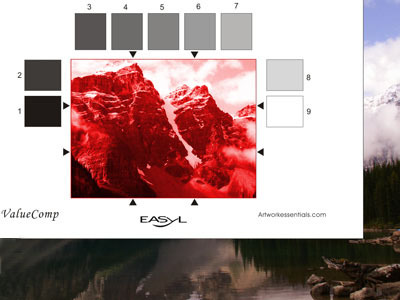 This is helpful in plein air painting in general, but not the only way for value. Hold the ValueComp about one foot from your eyes, and see through the composition window with one eye. The triangles along four sides of the window denote the 1/3 positions on each side. When your eyes connect them will form the place your focal point by placing your object at either one of the intersections. Move around till you find the ideal composition. Here is a fantastic idea on using ValuComp and View Finder for composition by artist Anne Blair Brown. to view her OPA Blog article regarding "It was My Understanding There Would Be No Math .."